A quick public service announcement via Tiny Kitchen Stories: I will be participating in Automattic’s Worldwide 5k WP event taking place between April 23-29. If the idea of running 3.1 miles “along” with a bunch of other bloggers appeals to you, get the details at Automattic Worldwide 5k WP. After you run, blog about it. Onward. Day three. Pasta salad. But not PASTA salad, because there’s a nice balance of vegetables to go along with the carbs. I love having a salad that I can mix up early in the day for dinner that night; the flavors just get better. Another easy, oil-free salad with tons of zesty flavor that is easy to make! First, cook the orzo according to package instructions; drain and set aside. In a large bowl, combine the black-eyed peas, tomato, parsley, garlic and the red wine vinegar and orange juice. Add a pinch of salt and pepper, stir and let marinate for about 15 minutes. In another bowl, combine the orzo, cucumber, olives, red onion, lemon zest, lemon juice, broth, oregano and pepperoncini. Add a pinch of salt and pepper. Now you’re ready to combine the black-eyed peas mixture with the orzo mixture. If desired, layer plates with fresh greens and then top with the orzo salad. This one is my favorite so far, but I know you still have a few days left! I really like this one, too! Looks great. And starting with canned peas makes it quick, too! What exactly is orzo? I’ve never heard of it. It’s a small pasta – so really any kind of pasta would work here. I just like the small size of this particular kind. Haha! They’re wonderful, aren’t they? Orzo is so great- definitely one of the best pastas in my opinion. This looks so satisfying! Another great salad to try 🙂 Thank you!! I love orzo, it gives me that pasta/rice combo that I crave! This looks delicious! Thanks! I love my rice and pasta, too! Ha! I like it! Gotta get your veggies. Black eyed peas!! So cute and yummy and in a salad! I am loving the series this week! Looks wonderful, again! I’m loving this salad series! That would be fun! But you do amazing things in the kitchen, maybe you should cook for us ;-)! 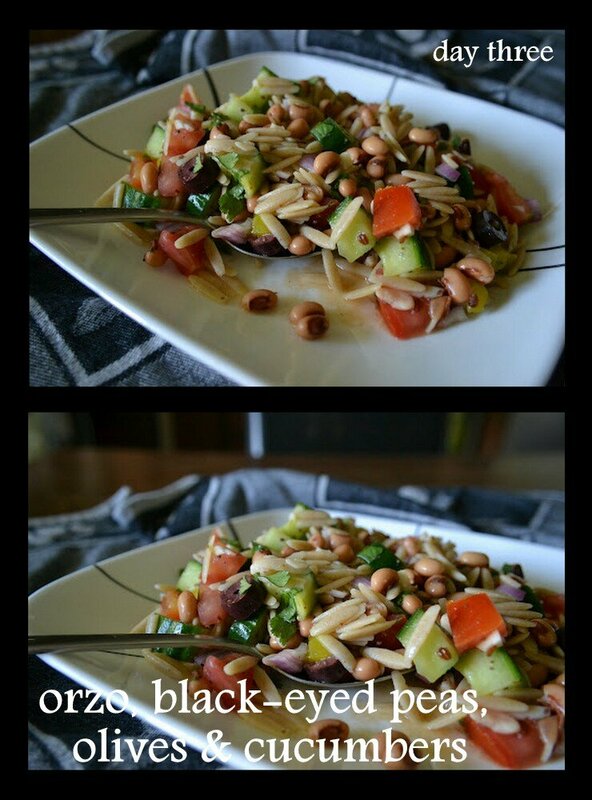 Orzo salad – so perfect for summer! This looks so fresh! God, love ALL your salads! Healthy and delicious! How do you come up with the combinations? They’re lovely! 🙂 – sometimes from whatever is in the refrigerator!